The menswear shows have wrapped, and after a journey from London to Florence, then Milan and finally Paris, it’s time to reflect on the season that was. While there were those which stunned thanks to their sets (Rick Owens’ towering scaffolding springs to mind), entertained with performance (the circus troupe Vivienne Westwood brought to town) and joined fashion and art together in unexpected collaborations (shout out to Jenny Holzer x Off-White) there was one show that was particularly notable for the immediate effect of sheer joy felt by its audience: Comme des Garçons Homme Plus. A bit of context: This was Rei Kawakubo’s first show since the monumental Met Gala, where the elusive designer gave a few rare press interviews and even told Lynn Yaeger she wasn’t actually going to show up. (She did, in a slightly fancier version of her standard Lewis Leathers biker, black skirt and trainers uniform). Of course, Comme was already a fashion and business behemoth, but a Met retrospective is another thing entirely; the hundreds of thousands of public visitors standing in line is a pretty different stage for Kawakubo’s work than her intimate fashion shows. As for the show itself, once the initially reluctant designer had been talked into doing it, she went all out – even creating an 116,000 square foot mock-up of the space in Tokyo. If there was ever a time that the already mysterious Kawakubo seemed even more like a deeply serious, incomprehensible genius, this was it. So, entering the grand Salle Wagram that made up the Comme menswear show space, it’s safe to say the audience was probably expecting something thought provoking, loftily conceptual, or even sombre. After all, the last few Comme menswear shows have explored ideas including boyhood, ‘the armour of peace’, and the emperor’s new clothes – this season has the added backdrop of a world which feels like it’s inching towards crisis, as exemplified by the hot new trend of bomb detector dogs outside shows. 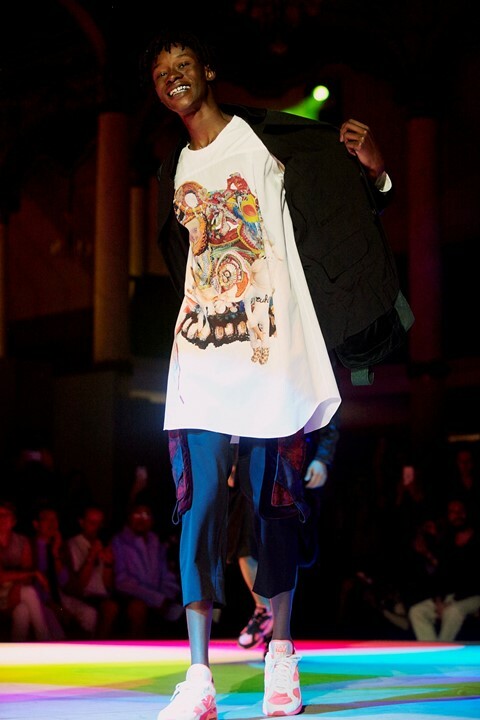 Instead, as the lights went down, something else happened entirely: the raised, square catwalk was lit with a myriad of swirling, technicoloured spotlights, the thumpingly loud soundtrack kicked in, and the young gang of models bounced up onto the stage with more energy than had been seen all month. 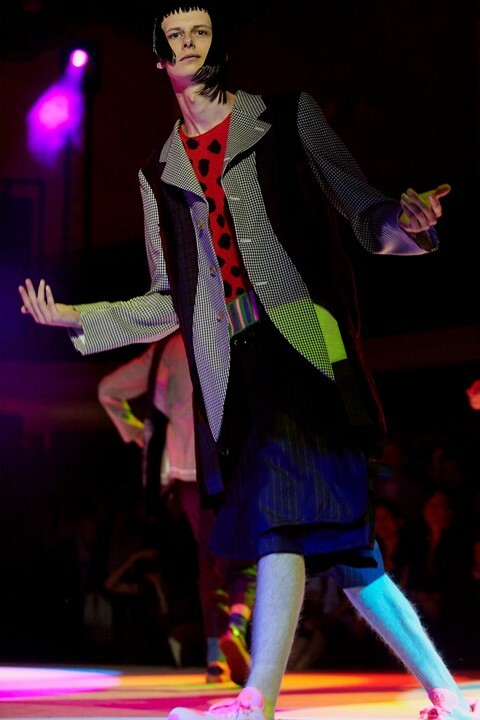 Dressed in a wild, hyper-saturated patchwork of colour, pattern, texture and print, they danced, paced, vogued, threw poses. 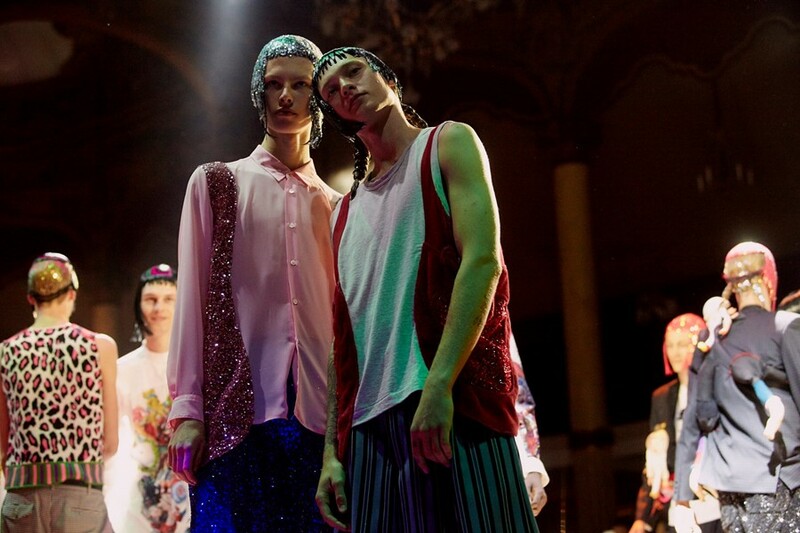 They wore jackets that clashed red Flinstones-esque faux fur with colourful florals and rainbow lurex. Some looks were almost entirely constructed of thousands upon thousands of shimmering sequins which reflected the bouncing lights, while the shoes on models’ feet (limited edition Nike 180s) seemed to glow neon as if under an ultraviolet light. At points looking like teenage boys dancing clumsily at their first party, there was something seriously charming about the way the models moved around the space. It certainly did the job, with the breakneck BPM leaving the audience bobbing up and down in their seats (Tyga, sitting in the front row, looked thrilled). After the show, the name for the collection was declared to be ‘what's on the inside matters’ – almost all of the crazily colourful jackets were in fact worn inside out, so it was their linings the audience had been seeing. Kind of a funny phrase when you consider we’re talking about fashion, but nevertheless – the effect of the show was notable and immediate: it made people happy. Like the hours spent losing yourself on the dancefloor of an amazing club, it was a moment that got as close to euphoric escapism as fashion can manage. Disco died because it became formulaic, predictable and tired. Despite the blockbuster exhibition and the accompanying red carpet spectacle, Rei’s catwalk party proved that there’s no danger of that happening to Comme.